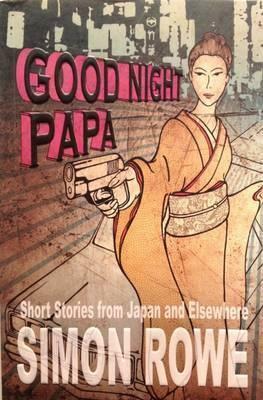 Good Night Papa: Short Stories from Japan and Elsewhere by Simon Rowe. Castlemaine, Australia: Atlas Jones & Co., 192 pp., $11.99 (paper). I was surprised when I looked at the back cover of Simon Rowe’s Good Night Papa, for I had somehow expected a book of stories set strictly in Japan. On the front, though, it was spelled out clearly: “Stories from Japan and Elsewhere.” Little surprise I suppose, for the writer himself is a journeyman, a New Zealand native later transplanted to Melbourne, and living for the past 20 years in Himeji, Japan. His previous work too is well-travelled, having touched down in such diverse publications as TIME Asia, the New York Times, the Weekend Australian, the South China Morning Post and The Paris Review. In the eponymous title piece, Rowe starts with a hard-boiled tone that first reminds the reader of writers such as Cain and Chandler. Yet little by little the story begins to take on a psychological-noir element, with a passing resemblance to Birnbaum–era Murakami. But rather than stories revolving around a missing woman (though there are a couple of those), the narrative catalyst in all the stories seems to be the coming together of strangers, or the recognition that a loved one carries deep secrets that threaten to usurp their identity. During his copious amount of travel, Rowe grew particularly interested in the storytellers he encountered, especially those who are able to embed us strongly in the soil of those places where their stories take root. Thus, Good Night, Papa is a collection of short stories told. And it is effective, despite breaking the cardinal rule of creative writing: “Show, don’t tell.” The single story that didn’t work for me was the final, “The Foonabiki Barbers,” presented in the form of a screenplay, the ultimate forum for the “shown” story. The explicit nature of the beat-by-beat action seemed out of place when combined with the more subtle entries earlier in the book. Not to say that Rowe can’t write a screenplay, as “Foonabiki,” as well as screenplay adaptations of ”Good Night Papa” and “The Pilgrim” have placed highly in screenplay competitions in the US. Reviewing a collection of short stories is tricky because you find yourself alternating between reviewing the sum of the book as a whole, or each of its component parts. (And if the latter, you are inadvertently reviewing the choices of the editor.) Inevitably, all anthologies or short story collections tend to be uneven. In this particular case, Rowe seems most adept when writing about his adopted home Japan, or when narrating through characters that are Australian. In the Himeji-set title piece, we meet a late night driver for hire, at first glance a victim of his own bad choices, who over the course of the story leads us along dark passages of grief. The Australian–set “The Finke River Mail” is a study in isolation both within the stark environment of estranged relationships and a harsh natural landscape. Nevertheless, even what I found to be the lesser stories still entertain, mainly due to their twist endings (The ending to “Meet Me under the Plumeria Tree” is particularly clever). These stories are a fine parallel with the nature of travel, and with the nature of encounters along the way. The road is rarely straight, and how wonderful the rush when we wend through the curves.